I am intrigued by the iPad’s potential as a computer for people with intellectual disabilities (ID). It could be set up as a Web-access only device, and essential functions could be Web-based. This could be done with computers, but the iPad has at least two distinct advantages. These advantages alone are enormous in terms of overall ease-of-use. They are also great for dramatically reducing long-term technical support- and training costs compared to those needed for computers. I think that to make an iPad truly useful for people with ID, an even simpler interface could be developed for it. I imagine that, upon being turned on, the iPad could present three or four buttons. One button could start a Web-based e-mail app, such as CogLink that is designed for people with ID, or one with which a user is already familar, such as Yahoo Mail. A button could start a Web browser app, like Web Trek, which is designed for people with ID. Another button could start an augmentative-communication app. They exist already. Jane Farrall recently posted a list of iPhone/iPad augmentative communication apps on the Spectronics Blog. An iPad, with a simple-to use interface similar to those presented by augmentative communication apps, would be a lot less expensive than single purpose AC devices or multi-function computers. All eyes on iPad, a Great Schools article, by Valle Dwight, which describes how the iPad might be a an assistive-technology device for her son with Down Syndrome. iPad Accessibility, an Anikto blog article by Kel Smith, which discusses the iPad’s potential for people with cognitive disabilities. Seven Days with the iPad: An Accessibility Evaluation by Darren Burton of The American Federation for the Blind. Note: For the purpose of exploring the iPad’s potential for people with intellectual / cognitive disabilities, one was generously provided to me by the project for which I work, New England INDEX at the Shriver Center, part of The University of Massachusetts Medical School. Two upcoming- and two recent conferences are listed below along with their related topics and presenters. October 21, 2010 – Westminster, Colorado, U.S.
June 9, 2010 – Providence, Rhode Island, U.S.
Know of another such conference? Please post a comment. Reader, a new feature of Safari 5, removes visual distractions from Web pages. This is a boon for people with cognitive disabilities, indeed everyone distracted by advertisements, contextually-irrelevant images, etc..
Clicking the button, which changes its color to purple, activates Reader. The following image shows the result: a view of only the page’s primary text. Clicking the button again or pressing the “Esc” key deactivates Reader. A toolbar appears near the bottom of the screen. It presents options to reduce- and enlarge text size, forward the article via e-mail, and print it. Safari 5 remembers the selected text size the next time the article is viewed. Every page of the article is displayed within Reader. Neither the toolbar nor the Reader button are keyboard accessible. The toolbar appears for just seconds, so using it means acting fast and with accuracy. Clicking a link to an external page, even if Safari 5 recognizes it as an article, displays it outside of Reader. 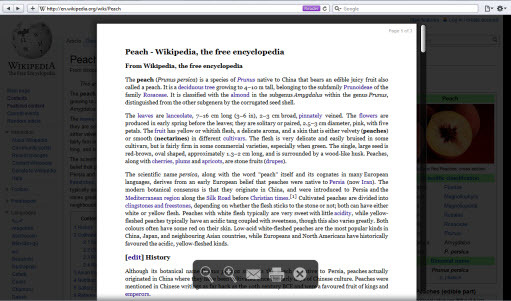 This is the first time such a readability tool has been built into a popular Web browser. I hope it is adopted by all the others. For now, equivalent tools can be added to browsers via plug-ins. Three I have reviewed are listed below. I also hope these readability tools show Web designers how difficult the reading experience can be. Large- or animated advertisements and other distractions can drive people from Web sites. Simple page layouts designed for readability can have the opposite effect. An example of this is Craig’s List. Note: The version of Safari referenced above is 5.0 (7533.16). No endorsement of it is intended or implied. TidyRead, similar to the other such tools I have described, is a free bookmarklet that strips the clutter from Web pages and otherwise makes them easier to read. Unlike them, it works on the iPhone and the iPod Touch. It also works with Firefox, Chrome, Safari, Opera and Internet Explorer. While TidyRead does not have as many configuration options as those offered by Readability and Readable, it does offer them on demand. With the latter two tools, users configure how they want the main content of Web pages to appear, and then they add the bookmarklet to their Web browsers. TidyRead has no pre-configuration. After its bookmarklet is installed, a click to it presents the toolbar, shown below, at the top of each page it displays. It adjusts the presentation of content as options are selected. The toolbar has buttons to change background color, font size and margin width. Its “More” menu includes settings to change the font family and the text alignment. TidyRead does not have the great feature Readable has, which enables users to select the content they want to display. If TidyRead can not determine the main content of a page, it displays the error, “This page doesn’t look like an article, and TidyRead couldn’t extract”. TidyRead can be installed on the iPhone and the iPod Touch by syncing Firefox- or Safari bookmarks with iTunes. Alternatively, there are step-by-step installation instructions. The reason I am investigating these readability tools is that they could be quite useful to people with cognitive disabilities who are distracted by extraneous content on all Web sites. Maybe, in addition to offering easy- and standard versions of the future Clear Helper Web site, I could offer on it one of these tools to install. No endorsement of TidyRead is intended or implied. Readers may be interested in my Readability Resources Related To Cognitive Web Accessibility. Stop Using JAWS for Web Accessibility Testing? Since before Web-accessibility evaluation tools were available, developers have used JAWS to test their Web sites. I have for so long that not using it never occurred to me. I was spurred to consider the possibility at a recent demo about the newest version. Eric Damery of Freedom Scientific, the maker of JAWS, proposed it. This post details the reasons I am considering no longer using JAWS for Web accessibility testing. Future posts will discuss alternatives. JAWS is wonderful software. For a person with a significant visual disability, it reads aloud or converts to Braille the content sighted people view on their computer screens. Without the JAWS screen reader or one of its competitors, hundreds of thousands of people would be unable to use computers, nor would they be able to access the Web. People who are blind have long been considered the most excluded from the Web. This is the central reason Web accessibility standards have been focused on making sites accessible to them. (An even larger excluded population are people with cognitive disabilities, but that is a topic for another day.) Thus accessibility-minded developers have always considered it important to test sites with a screen reader. JAWS is chosen for this because people with visual disabilities use it more, by far, than any other screen reader. Another benefit of accessibility testing with JAWS is that sites made compatible with it also often work well for people with physical disabilities. People who can not use a mouse, and/or who use a single-switch device instead of a keyboard, can navigate an accessible Web site in a way similar to that of JAWS users. A simple approximation of this experience is to visit a Web site and attempt to navigate it using only the Tab key. Though I have used JAWS to help test Web accessibility since the time (1995) it was first available, I know only enough about it for such testing. Like all screen readers, JAWS is complicated. For people who must use it to access a computer, many months are typically needed to learn it well. Over the years, as I have hired developers and introduced them to Web accessibility and JAWS, it has been difficult for each to master it sufficiently for accessibility testing. In part this is because they don’t have to use it all the time as people who are blind do. Another reason developers find JAWS troublesome is that the Web content it reads can not be visually tracked. The temptation for sighted developers to watch JAWS is too great. They are so dependent upon their sight that trying to get them to test Web sites while their screens are off, for instance, is difficult. Sighted developers inexperienced with JAWS, and sighted people to whom JAWS is being demonstrated, are often confounded by the way it reads Web content. They expect it to read an entire Web page as they perceive they do. Instead, JAWS reads Web pages in chunks and pauses before links. This behavior closely mimics what sighted people really do, which is to skim Web page content. JAWS is expensive. At the time of this writing, it costs $895 for most people, plus an annual software maintenance agreement (SMA) of $120. Cost alone can be an initial barrier for people who are blind and, as a population, are chronically underemployed. For developers who use JAWS to test accessibility, Freedom Scientific requires the more expensive professional version. Its cost of $1,095 plus a $200 yearly SMA can be a barrier for developers without institutional backing. To evangelize accessibility testing to other developers, I am interested in lower-cost or free alternatives. “Ninety percent of blind people don’t use a screen reader.” Kevin Carey, Chairman of the Royal National Institute of Blind People (RNIB), said that recently at an INMD seminar for Web developers. He also said that is the reason Web sites should be made “self-voice”. I imagine he was referring to people who are legally blind. To access Web sites, they must use screen-magnifiers, text-to-speech software, and/or Web site widgets. JAWS is only one of many tools my team has used to test Web site accessibility. Most importantly, people with disabilities have always been hired to vet the accessibility of our Web sites as much as possible. Reason 5 may mean I should place more emphasis on my experiments with text-size enlargement and incorporation of text-to-speech features. The quotes attributed to Kevin Carey were provided to me by a person who attended the seminar. I am interested in feedback. Please comment. This post is about reports from CogLink, e-mail software designed for people with intellectual disabilities. I have been receiving them in my capacity as the “Helper” of the person using Coglink (also me). In my review of CogLink, the last of three posts about it (see list below), I explained the CogLink term “Helper”. It is someone who installs it, provides assistance during automated training on how to use it, and manages its advanced features. One of them is an option to receive monthly usage reports. Reports have two sections: monthly- and weekly statistics. Each has two subsections. I think these reports are useful in helping people with intellectual disabilities learn how to use e-mail. Because repeated, consistent training is likely needed, these reports are a good way to track related problems over time. The reports do not include confidential information, such as the content of e-mail messages, nor statistics broken down by e-mail “Buddies” (Coglink’s term). In my opinion, the reports provide just enough information to be helpful without being invasive of privacy. Note: No endorsement of CogLink is intended or implied.